Worth every penny to help change your attitude to food and be healthier. Being a sporty male, I was interested by the long-term health benefits. Inspirational reading! Kate's honest guide helped me through the first fast day. It should be your bible. The 5:2 Diet will transform your body, your mind and your health. 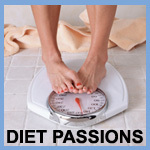 It’s the revolutionary part-time weight loss diet with lifelong health and anti-ageing results. This is the simplest, most flexible and most health enhancing weight loss programme you’ll ever follow - and with this book to guide you, you can start today. You’ll still get to eat all the foods you love but enjoy incredible health benefits, with positive effects on cancer, heart disease, Alzheimer’s and more. Journalist and former yoyo dieter Kate Harrison has finally won the battle with her weight – now she shares the secrets that are helping thousands of men and women transform their bodies. The 5:2 Diet Book is your comprehensive guide to the wonderful world of intermittent fasting. • The cost savings you can make – saving pounds from your food bill as you lose them from your body! • Or ready-made suggestions for when you don’t feel like cooking. • Hundreds of real-life tips and success stories from men and women like you. This is more than another diet craze – it’s anything but crazy and it’s a lifestyle you’ll want to adopt for the rest of your life.